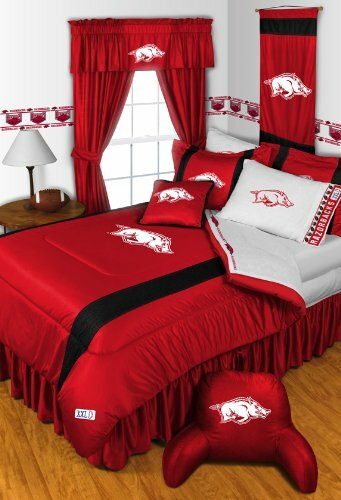 Arkansas Razorbacks NCAA 8 Pc FULL Size Comforter Set and One Matching Window Valance/Drape Set (Comforter, 1 Flat Sheet, 1 Fitted Sheet, 2 Pillow Cases, 2 Shams, 1 Bedskirt, 1 Matching Window Valance/Drape Set) SAVE BIG ON BUNDLING! - 8 PIECE FULL BEDDING SET: [Comforter, 1 Flat Sheet, 1 Fitted Sheet, 2 Pillowcases, 2 Shams, 1 Bedskirt] - 1 Valance / Drape Set: [(NOTE THAT THE CURTAINS DO NOT HAVE LOGOS. ONLY VALANCES HAVE LOGOS) CONTENTS OF VALANCE/DRAPE SET: Two rod pocket curtain panels totally measuring 82 inch wide (horizontal) x 63 inch long (vertical); Two matching tie-backs; One valance with screen-printed logo 88 inches wide (horizontal) x 14 inches long (vertical).] Please note: This sale is only for the items described. Other items pictured are for illustration only. LSU Tigers NCAA 8 Pc QUEEN Comforter Set and One Matching Window Valance/Drape Set (Comforter, 1 Flat Sheet, 1 Fitted Sheet, 2 Pillow Cases, 2 Shams, 1 Bedskirt, 1 Matching Window Valance/Drape Set) SAVE BIG ON BUNDLING! Minnesota Wild 8 Pc QUEEN Comforter Set and One Matching Window Valance/Drape Set (Comforter, 1 Flat Sheet, 1 Fitted Sheet, 2 Pillow Cases, 2 Shams, 1 Bedskirt, 1 Matching Window Valance/Drape Set) SAVE BIG ON BUNDLING! Minnesota Wild 5 Pc TWIN Comforter Set and One Matching Window Valance/Drape Set [84 Inch Drapes] (Comforter, 1 Flat Sheet, 1 Fitted Sheet, 1 Pillow Case, 1 Sham, 1 Matching Window Valance/Drape Set - 84" Length Drapes) SAVE BIG ON BUNDLING!